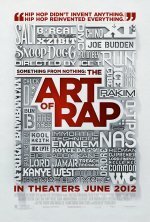 Something From Nothing: The Art of Rap release date was Friday, June 15, 2012. This was a Limited in theaters release. Ice-T travels coast to coast, visiting with the likes of Afrika Bambaata, Grandmaster Flash, Nas, Mos Def, Eminem, Chuck D, Run-DMC, Dr. Dre, Ice Cube and Snoop Dogg to trace the inspiration for an American art form, hip-hop.